Thanks to the 550+ subscribers that have already purchased my new eBook in the first 4 days since I made it available. The reception has been fantastic. For others there is more information and ‘Buy’ buttons at this link. If, during a stipulated round, a player's club is damaged other than in the normal course of play rendering it non-conforming or changing its playing characteristics, the club must not subsequently be used or replaced during the round. Penalty for Breach of Rule 4-3b: Disqualification. Perhaps the most interesting aspect of this incident is that following the change to the new Rules of Golf in January 2019, playing with a damaged club will no longer get a penalty, New Rule 4.1a confirms that, providing a club is conforming when the player commences their round, they may continue to use it, or have it repaired, no matter what the nature or cause of the damage. This is a sensible and welcome change, because there is certainly no advantage for a player using a damaged club, so in any circumstance similar to that of Lee-Anne Pace it seems obviously unfair that the player should be so harshly penalised (disqualified) for using one. This is a good example of how one of the new Rules will eliminate unnecessary complications and will make perfect sense to most golfers, who for the most part are just looking for Rules that apply in a logical, equitable and easy to remember way. The R&A’s Official Guide to the Rules of Golf, effective January 2019, is available to preorder from Amazon.co.uk with a release date of 1st November. The Official Guide includes The Rules of Golf with Interpretations (previously known as Decisions), Committee Procedures, Model Local Rules and Modified Rules of Golf for Players with Disabilities. However, at the time of writing, on the Amazon.com web site it appears that the USGA version of the Official Guide will not be released until January 1st, 2019! 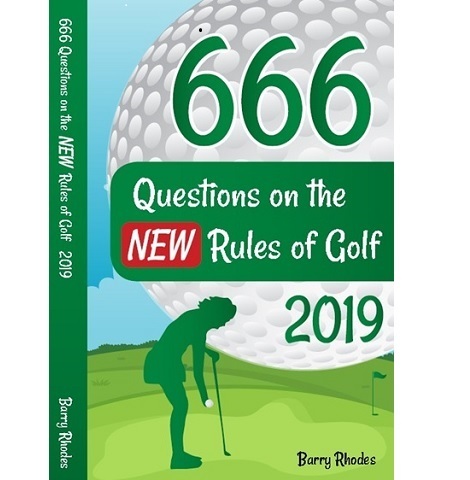 Of course, I expect that both the R&A and USGA are making plans for the Guide to be available to Club Committees earlier than either of these dates, but neither of the Ruling Bodies have any pre-order facility for any of the New Rules publications on their on-line shops, which seems remiss. Have you signed up for the free Rules of Golf newsletter from my associate, Brian Oswald of The Oswald Academy? Here is the link. Brian and I are working closely together to ensure that we present our subscribers with the latest information on Rules information and incidents and will be introducing a range of resources over coming weeks to make it easier for golfers to understand, assimilate and learn the new Rules in preparation for January 2019.